The Springhill subdivision sits right on the line between Holly Springs and Fuquay Varina, NC, just off 55. Springhill is a small community of approximately 150 homes with a small town feel that is close to everything. There's a very wide range in housing from 1,440 sf ranches to large 2-story's with 2,800 sf. You can get a lot of home for the money here. HRW is the management company that handles the HOA. The dues are currently $72 billed quarterly for maintaining the common areas. 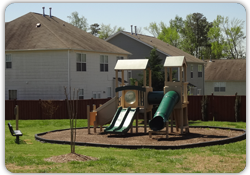 If you have children and schools are important to you, check out our Holly Springs School page. If you know the property that you're interested in buying, you can check on the base school assignment to see what schools have been assigned to the address.